The value of internet celebrity is hard to assess, but a new motion filed by the owners of the animal star known as Grumpy Cat seeks to do just that. In it, the holders of the “GRUMPY CAT” trademark have asked a court to triple a requested $600,000 award over alleged copyright infringement of a goddamn cat. However, Grenade allegedly went beyond that agreement and started selling Grumpy Cat Roasted Coffee. 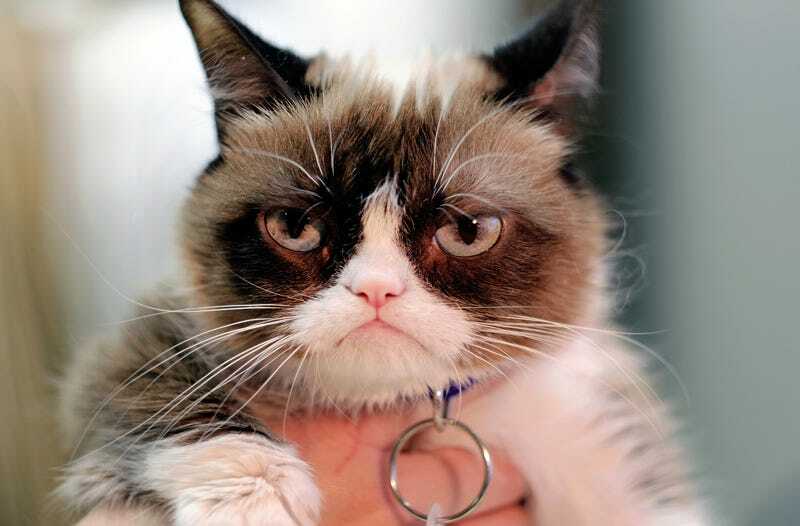 In addition, Grumpy Cat claims that Grenade failed to provide an accounting of sales and profits and failed to pay a percentage of Grumppuccino profits, as well as selling unauthorized Grumppuccino T-shirts. Grumpy Cat says it is owed $150,000 for four violations and added that the amount should be tripled, under laws for copyright violations. In addition, the company wants all profits from Grumpy Cat-related products that were sold by Grenade, plus $15,000 in legal fees. In a just world, the rights to a cat’s appearance would only belong to that animal and God himself. With permission or without, expanding the spread of Grumpy Cat merchandise should be a jailable offense. Anyone who buys coffee because they like a cat from online has no business consuming any sort of stimulant. In the end, there’s really only one innocent here: The cat herself, who—like us—never asked for any of this.